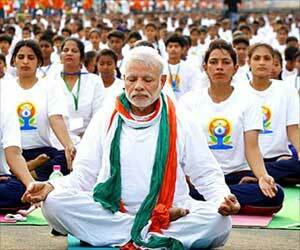 Was International Yoga Day, India’s Initiative? International day of yoga is being observed on 21st of June since 2015. This day is also a symbol of India’s soft power and its new global outreach. Modi recommended the date since it marks the longest day in the northern hemisphere. Many believe that it marks the day that Lord Shiva — one of the Hindu Trinity — began imparting yoga to his followers and became its first guru. Adopted in December 2015 in New York, the draft resolution had a record-breaking 177 co-sponsors, including the US and China. India is a repository of an astounding wealth of living patterns and modes of heritage. With about 1,400 dialects and 18 officially recognized languages, several religions, various styles of art, architecture, literature, music, and dance, and several lifestyle patterns, the country is the largest democracy with a seamless picture of diversity and unity, perhaps unparalleled anywhere in the world. India’s living cultural heritage has been shaped by centuries of adaptation, re-creation, and co-existence. The country’s intangible cultural heritage finds expression in the ideas, practices, beliefs, and values shared by communities across centuries. It forms a part of its collective memory. Yoga was added to UNESCO’s list of Intangible Cultural Heritage in December 2016. The international impact of India’s soft power was felt long before the term found a place in popular parlance in the 21st century. What is new is its strategic reorientation by Modi, who combined new elements of soft power to re-position India in the international community. In a strategic context, its five pillars are Samman (dignity), Samvaad (dialogue), Samriddhi (shared prosperity), Suraksha (regional and global security), and Sanskriti evam Sabhayata (cultural and civilizational links). Cleverly crafted, this new mantra represents a fundamental challenge to China’s quest for leadership in this area. India’s political values have now been embedded in a larger geopolitical context. Modi’s message is India can become a “viswaguru,” or world teacher. Cultural diplomacy and soft power have emerged as forces to connect and build bilateral relations and heal ruptures created by history and politics. Unfortunately, there are some in India’s neighborhood, notably Pakistan, who remain apprehensive of cultural connectivity across states and frontiers. The process, however, is unstoppable. The internet, the social networking sites, Bollywood, and now yoga, have contributed to the social connectivity across borders. Many in Pakistan are trying to revive, re-establish and reinvent their past socio-cultural connectivity with India. Ultimately, culture and soft power remain powerful mechanisms to enable antagonistic states to overcome years of mutual mistrust and push forward the process of regional integration. The process is not new. Immediately after World War II, school children from France and Germany were sent on exchange programmes to learn about each other’s culture, language, and customs. The result today is striking. Within the European Union, the strongest partnership remains the Franco-German one. The diplomatic community in Delhi eagerly awaits this year’s celebrations of International Yoga Day. On June 21, 2017, The Ministry of External Affairs organized a special yoga session for 100 diplomats. The Dean of the Diplomatic Corps, Ambassadors and diplomats enthusiastically participated by practicing asanas and pranayamas, giving a unique flavor to the event. “Vasudhaiva Kutumbakam” remains the first precursor of global citizenship as it is understood today — the concept that all individuals are collectively responsible for each other and their shared future. Ultimately, this “international binding” through International Yoga Day represents India’s new global narrative. It could be as important to its quest for great power status as her candidature for permanent membership of the Security Council.